Understand and be understood in English with the best-selling English Pronunciation in Use. Sixty easy-to-use units cover all aspects of pronunciation, including individual sounds, word stress, connected speech and intonation. Each unit is supported by audio material in a range of accents. An additional reference section offers a glossary of specialized terms, help with the pronunciation of numbers and geographical names, and fun exercises on phonemic symbols and minimal pairs. 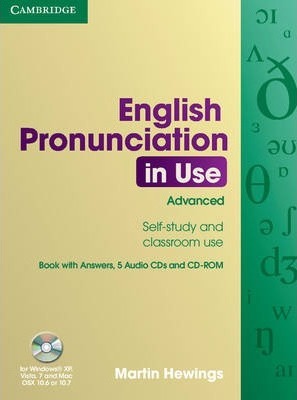 The CD-ROM provides a wide variety of additional interactive activities to reinforce the pronunciation covered in the book, as well as tests, progress checks, games and animated diagrams of the mouth showing learners how to produce individual sounds.